Authenticity and Integrity of the Book. Importance for Israel's Religious Development. Part i., ch. i.-iii.—Two symbolical actions: (a) At the command of Yhwh, Hosea takes to wife an adulterous woman, as a symbol of the people of Israel, who have deserted their God and must be punished for their desertion, but who will be restored to Yhwh's favor after a time of probation. (b) At the further command of Yhwh, Hosea is once more married to his former, unfaithful wife, as a symbol of the enduring love of Yhwh for His people in spite of their faithlessness. Part ii., ch. iv.-xiv.—Hosea's prophetic sermon on the sinful and idolatrous people of Israel. Announcement of the ruin that shall overtake Israel, now become morally and religiously degraded through the fault of its priests (iv. 1-14). 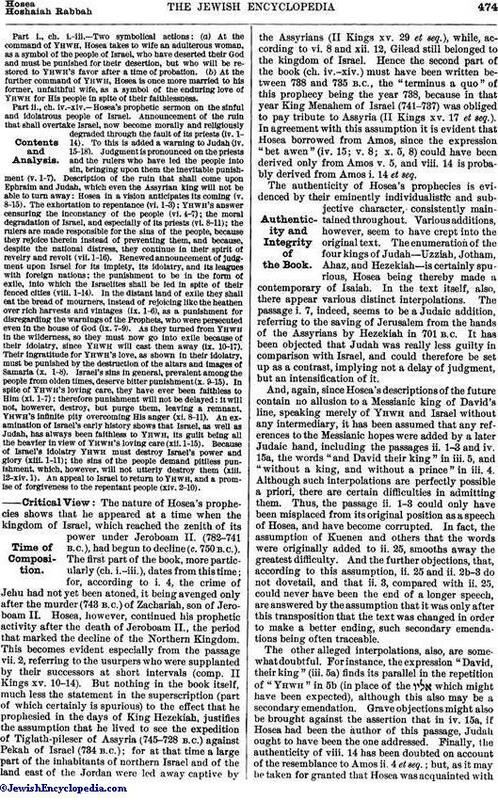 To this is added a warning to Judah (iv. 15-18). Judgment is pronounced on the priests and the rulers who have led the people into sin, bringing upon them the inevitable punishment (v. 1-7). Description of the ruin that shall come upon Ephraim and Judah, which even the Assyrian king will not be able to turn away: Hosea in a vision anticipates its coming (v. 8-15). The exhortation to repentance (vi. 1-3); Yhwh's answer censuring the inconstancy of the people (vi. 4-7); the moral degradation of Israel, and especially of its priests (vi. 8-11); the rulers are made responsible for the sins of the people, because they rejoice therein instead of preventing them, and because, despite the national distress, they continue in their spirit of revelry and revolt (vii.1-16). Renewed announcement of judgment upon Israel for its impiety, its idolatry, and its leagues with foreign nations; the punishment to be in the form of exile, into which the Israelites shall be led in spite of their fenced cities (viii. 1-14). In the distant land of exile they shall eat the bread of mourners, instead of rejoicing like the heathen over rich harvests and vintages (ix. 1-6), as a punishment for disregarding the warnings of the Prophets, who were persecuted even in the house of God (ix. 7-9). As they turned from Yhwh in the wilderness, so they must now go into exile because of their idolatry, since Yhwh will cast them away (ix. 10-17). Their ingratitude for Yhwh's love, as shown in their idolatry, must be punished by the destruction of the altars and images of Samaria (x. 1-8). Israel's sins in general, prevalent among the people from olden times, deserve bitter punishment (x. 9-15). In spite of Yhwh's loving care, they have ever been faithless to Him (xi. 1-7); therefore punishment will not be delayed: it will not, however, destroy, but purge them, leaving a remnant, Yhwh's infinite pity overcoming His anger (xi. 8-11). An examination of Israel's early history shows that Israel, as well as Judah, has always been faithless to Yhwh, its guilt being all the heavier in view of Yhwh's loving care (xii. 1-15). Because of Israel's idolatry Yhwh must destroy Israel's power and glory (xiii. 1-11); the sins of the people demand pitiless punishment, which, however, will not utterly destroy them (xiii. 12-xiv. 1). An appeal to Israel to return to Yhwh, and a promise of forgiveness to the repentant people (xiv. 2-10). 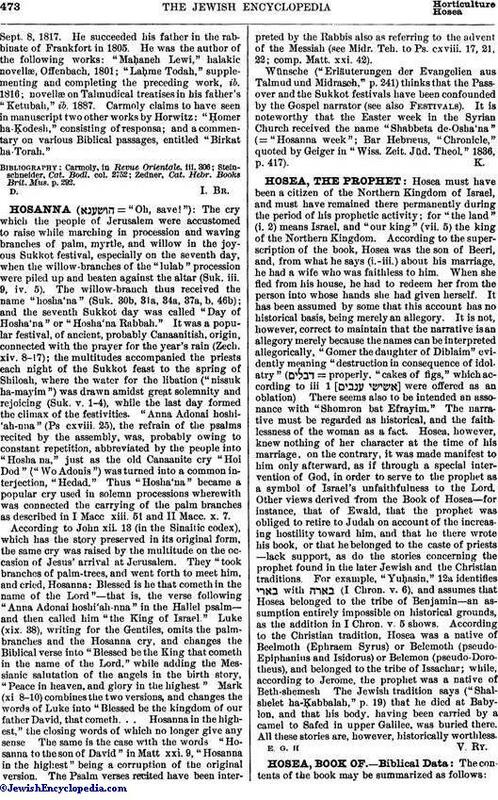 The nature of Hosea's prophecies shows that he appeared at a time when the kingdom of Israel, which reached the zenith of its power under Jeroboam II. (782-741 B.C. ), had begun to decline (c. 750 B.C.). The first part of the book, more particularly (ch. i.-iii. ), dates from this time; for, according to i. 4, the crime of Jehu had not yet been atoned, it being avenged only after the murder (743 B.C.) of Zachariah, son of Jeroboam II. Hosea, however, continued his prophetic activity after the death of Jeroboam II., the period that marked the decline of the Northern Kingdom. This becomes evident especially from the passage vii. 2, referring to the usurpers who were supplanted by their successors at short intervals (comp. II Kings xv. 10-14). But nothing in the book itself, much less the statement in the superscription (part of which certainly is spurious) to the effect that he prophesied in the days of King Hezekiah, justifies the assumption that he lived to see the expedition of Tiglath-pileser of Assyria (745-728 B.C.) against Pekah of Israel (734 B.C. ); for at that time a large part of the inhabitants of northern Israel and of the land east of the Jordan were led away captive by the Assyrians (II Kings xv. 29 et seq. ), while, according to vi. 8 and xii. 12, Gilead still belonged to the kingdom of Israel. Hence the second part of the book (ch. iv.-xiv.) must have been written between 738 and 735 B.C., the "terminus a quo" of this prophecy being the year 738, because in that year King Menahem of Israel (741-737) was obliged to pay tribute to Assyria (II Kings xv. 17 et seq.). In agreement with this assumption it is evident that Hosea borrowed from Amos, since the expression "bet awen" (iv. 15; v. 8; x. 5, 8) could have been derived only from Amos v. 5, and viii. 14 is probably derived from Amos i. 14 et seq. The authenticity of Hosea's prophecies is evidenced by their eminently individualistic and subjective character, consistently maintained throughout. Various additions, however, seem to have crept into the original text. The enumeration of the four kings of Judah—Uzziah, Jotham, Ahaz, and Hezekiah—is certainly spurious, Hosea being thereby made a contemporary of Isaiah. In the text itself, also, there appear various distinct interpolations. The passage i. 7, indeed, seems to be a Judaic addition, referring to the saving of Jerusalem from the hands of the Assyrians by Hezekiah in 701 B.C. It has been objected that Judah was really less guilty in comparison with Israel, and could therefore be set up as a contrast, implying not a delay of judgment, but an intensification of it. 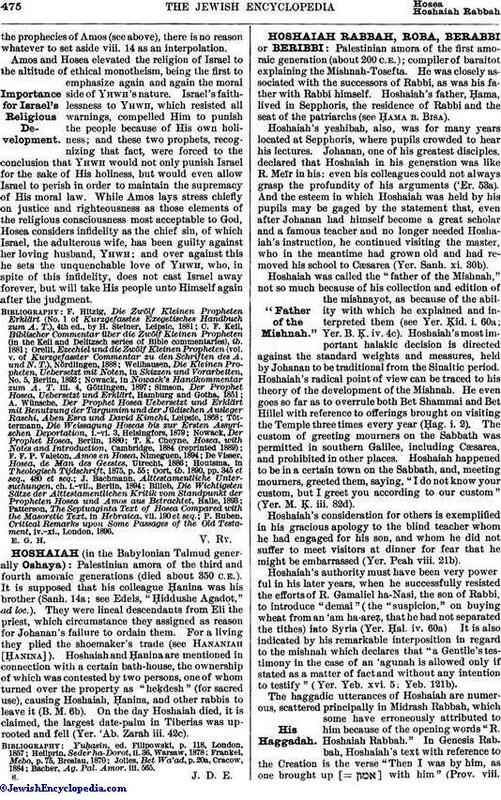 And, again, since Hosea's descriptions of the future contain no allusion to a Messianic king of David's line, speaking merely of Yhwh and Israel without any intermediary, it has been assumed that any references to the Messianic hopes were added by a later Judaic hand, including the passages ii. 1-3 and iv. 15a, the words "and David their king" in iii. 5, and "without a king, and without a prince" in iii. 4. Although such interpolations are perfectly possible a priori, there are certain difficulties in admitting them. Thus, the passage ii. 1-3 could only have been misplaced from its original position as a speech of Hosea, and have become corrupted. In fact, the assumption of Kuenen and others that the words were originally added to ii. 25, smooths away the greatest difficulty. And the further objections, that, according to this assumption, ii. 25 and ii, 2b-3 do not dovetail, and that ii. 3, compared with ii. 25, could never have been the end of a longer speech, are answered by the assumption that it was only after this transposition that the text was changed in order to make a better ending, such secondary emendations being often traceable. The other alleged interpolations, also, are somewhat doubtful. For instance, the expression "David, their king" (iii. 5a) finds its parallel in the repetition of "Yhwh" in 5b (in place of the which might have been expected), although this also may be a secondary emendation. Grave objections might also be brought against the assertion that in iv. 15a, if Hosea had been the author of this passage, Judah ought to have been the one addressed. Finally, the authenticity of viii. 14 has been doubted on account of the resemblance to Amos ii. 4 et seq. ; but, as it may be taken for granted that Hosea was acquainted withthe prophecies of Amos (see above), there is no reason whatever to set aside viii. 14 as an interpolation. Amos and Hosea elevated the religion of Israel to the altitude of ethical monotheism, being the first to emphasize again and again the moral side of Yhwh's nature. Israel's faithlessness to Yhwh, which resisted all warnings, compelled Him to punish the people because of His own holiness; and these two prophets, recognizing that fact, were forced to the conclusion that Yhwh would not only punish Israel for the sake of His holiness, but would even allow Israel to perish in order to maintain the supremacy of His moral law. While Amos lays stress chiefly on justice and righteousness as those elements of the religious consciousness most acceptable to God, Hosea considers infidelity as the chief sin, of which Israel, the adulterous wife, has been guilty against her loving husband, Yhwh; and over against this he sets the unquenchable love of Yhwh, who, in spite of this infidelity, does not cast Israel away forever, but will take His people unto Himself again after the judgment. P. Ruben, Critical Remarks upon Some Passages of the Old Testament, iv.-xi., London, 1896.